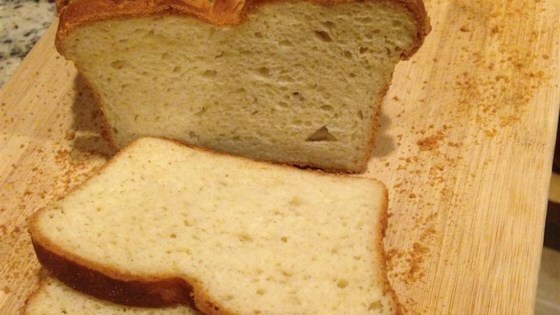 "Like most people with celiac, I find white bread is one of the foods our gluten-free family misses the most. I created this after much trial and error in trying to make a bread that tastes like real wheat bread." Dissolve yeast and sugar in warm water in a bowl. Let stand until the yeast softens and begins to form a creamy foam, about 5 to 10 minutes. Combine yeast mixture, rice flour, sorghum flour, potato starch, cornstarch, vegetable oil, eggs, xanthan gum, and salt together in the bowl of a stand mixer; mix on medium speed until incorporated, about 2 minutes. Spoon dough into the prepared loaf pan. Smooth the top of dough with the back of a wet spoon. Place dough in a warm place until it has risen just over the top of the loaf pan, about 1 hour. Bake in the preheated oven until loaf is medium golden brown, about 25 minutes. Tastes and looks just like wheat bread!